Kapamilya teen star Kathryn Bernardo has unveiled her official Facebook page amid allegations that a fake page has been using her for profit. 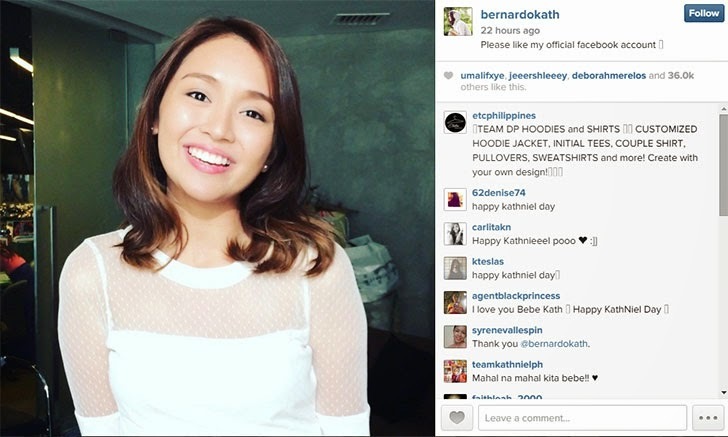 In a video posted Wednesday on Instagram, the young actress told her followers to like her official Facebook account, www.facebook.com/misskathrynbernardo. The official fan page of Star Records, a record label of ABS-CBN, also announced Kathryn's official Facebook page. Post by Star Records, Inc. (Official Fan Page). The announcement came three days after we published a report titled "KFC Endorser Kathryn Bernardo Shares Negative Report vs McDonald's." The post is about a link to a blog post from another blog shared by the unofficial fan page with over nine million likes, which apparently created a bad image for the singer-actress instead of promoting her. According to blogger Mc Richard Paglicawan, owner of the famous trending news site The Daily Pedia, the post caught the attention of Kathryn's team and even reached advertising agencies. After the creation of Kathryn Bernardo's official Facebook page, it is expected that other Kapamilya stars with "verified" Facebook fan pages (created by bloggers and individuals that are not part of their official social media teams) will follow suit.